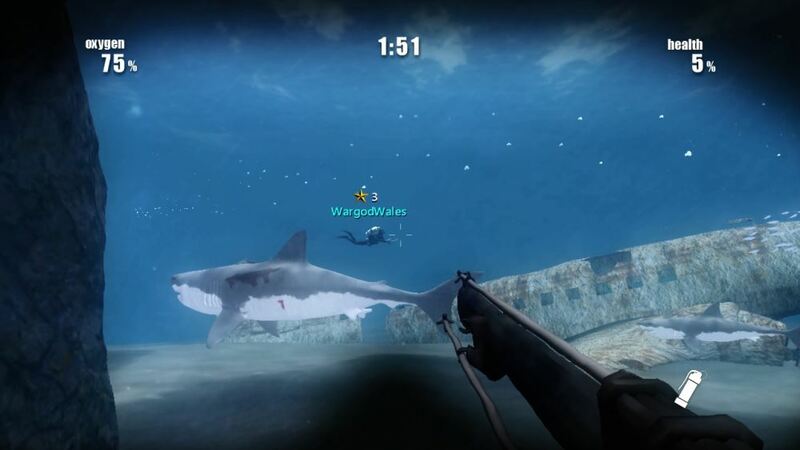 Shark Attack Deathmatch - everything you need to know! 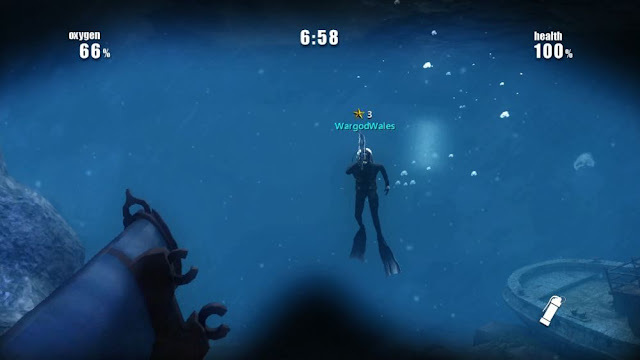 Oxygen - whilst swimming around you will use up oxygen, in Deathmatch there are 4 locations where you can pickup an oxygen tank which will restore your oxygen back to 100%. There is one at the base of the cliff, on the 2nd floor of the ship, inside the aeroplane, and one hidden in the main centre rocks (I'll let you find that yourself). Oxygen burns up much faster when you are swimming fast (i.e. when holding down the left analog), so if you running low on oxygen DON'T swim fast! Health, there are just 2 health packs in the level, each one gives you a 25% health boost. They can be found at the top of the cliff (just above the oxygen) and near the rear of the ship on the sea floor. Stun Grenades: Blinds nearby players for up to 20 seconds (they have to be looking at the grenade at time of explosion in order to be blinded) Use the Right Back button to throw a grenade. 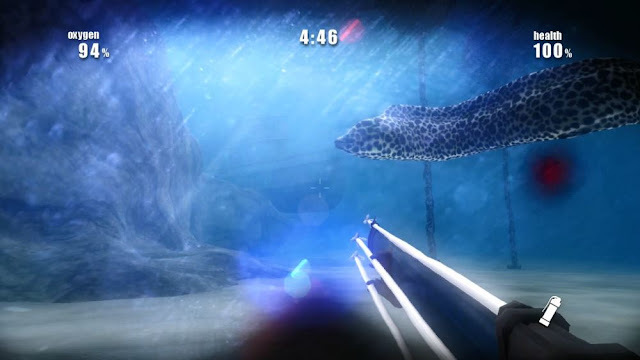 Sharks will from time to time hunt and attack a player. Sharks can be killed, it takes around 3 hits with a speargun to kill a shark. 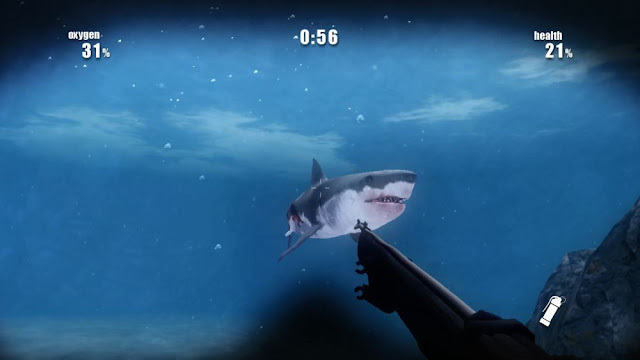 And shooting a shark will definitely anger any other nearby sharks and they will join in the hunt. If you are attacked by a shark your best bet would be to swim fast directly up or down, or find some form of cover. And be sure to like the Facebook page to keep up to date on new updates! Oops. Sorry, it looked like my comment double posted, so I deleted it. Uh. Add in a tournament mode. 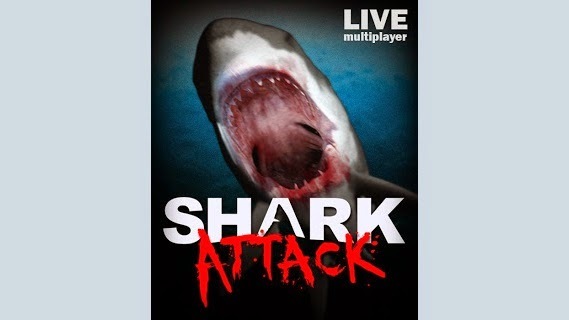 And then rename the game Super Shark Attack Deathmatch Hyper Turbo Edition. 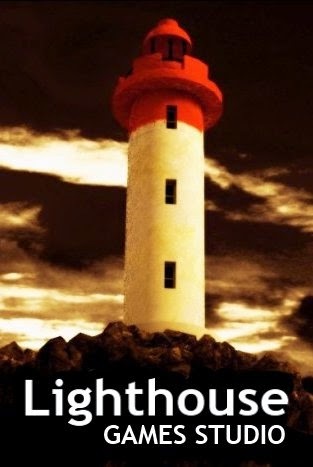 Lighthouse Games Studio was founded in Durban, South Africa in 2009.